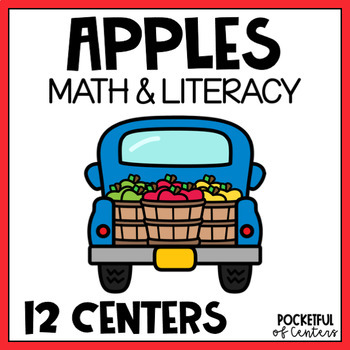 This APPLE Centers BUNDLE is loaded with hands on work stations for your PreK or Kindergarten classroom! This unit contains 5 literacy work stations and 5 math work stations for a total of 10 work stations in all! PLUS a freebie: Five Little Apples Pocket Chart! 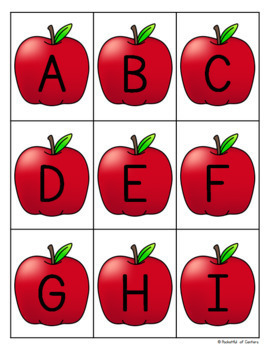 Apple Letter Bingo Practice uppercase and lowercase letter recognition with this apple themed bingo game. Includes 20 game boards and 2 sets of calling cards. Apple Rhymes Children will have fun sorting rhyming words with this fun apple themed activity. This set includes two sorting mats - "rhymes" and "does not rhyme" and 32 picture cards to sort. Apple Beginning Sounds Match This game can be played like the traditional "Memory" game. 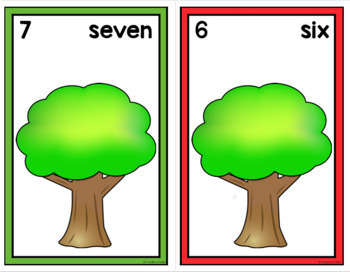 You can also use the cards during circle time and have the children place the matching beginning sound cards next to each other on the pocket chart . . . and then keep it in the Pocket Chart Center! Apple Sight Word Puzzles Make 36 sight word puzzles and record the words. Apples Letter Game This Spin a Letter Center is a fun way to practice letter identification and letter writing. The children will spin the spinner and cover or trace the letter. This game offers letter practice for all of the uppercase and lowercase letters from A to Z.
Apple Patterns This set provides a great way teach your students to identify and continue AB, ABC, ABB, and AAB patterns with pictures. There are 12 pattern cards for each type of pattern. Each set contains cards to complete each pattern. 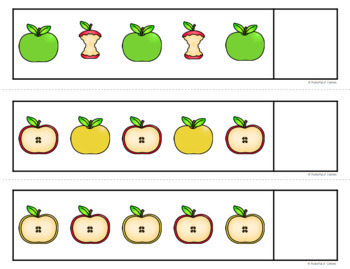 Apple Counting Mats 0-20 This packet includes an apple tree counting mat for the numbers 0-20 and a sheet of colorful apples. Each mat includes the numeral and number word. When they are placed in order you will notice an AB pattern in the background! The children will use the apple counters (included - or use mini apple erasers or small red pompoms) to count out the correct amount of apples to place on each mat. Roll, Say, Keep Shape Recognition GameThis fall-themed game is a fun way to practice shape recognition. It is great as a work station or a send home game! Shapes included: circle, square, triangle, rectangle, heart, oval, rhombus, pentagon, octagon, hexagon, and trapezoid. This also includes pictures of 2D objects! Apple Ten Frames To play the game the children choose a spinner and add (or subtract) the apples until there are 10 apples on the ten frame. There is also a set of ten frame mats labeled 1-10. These are great to add to a math center or morning bins. Place a container of mini apple erasers (or use the ones provided) and the children place the correct amount on the ten frame. Five Little Apples Pocket Chart This is a great set to use during circle time and in your pocket chart center. This packet includes a poem page, apples and Mr. Slinky Worm for crowns to act out the poem, and the words ready to print and place in your pocket chart. Looking for more Fall Centers?